The omega-3s in TheraTears Nutrition come from fish oil that has been molecularly distilled and from organically grown cold-pressed flaxseed oil. To maintain the integrity of these high quality omega-3s we fortify each capsule with Vitamin E. TheraTears Nutrition is a source of omega-3 fatty acids for the maintenance of good health. Non-medicinal ingredients: Gelatin, mixed tocopherols, glycerin, water. With both of my orders I received the products promptly. It has been a pleasure dealing with this company. 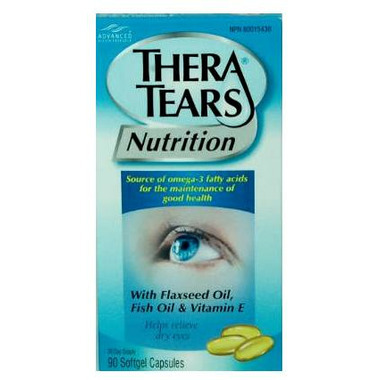 I am so glad they carry Thera Tears Nutrition. Best dry eye product on the market! I live by them! Extraordinary. Prescribed by my optometrist. Saw a change in my eyes after only a few days. I buy it now for my mom. I started using this product for an eye-gland related problem along with chronic dry eyes.It has really helped with the dryness, redness and has improved my gland functioning. . I enjoy ordering from Well because the price is right, the shipping is super fast and the free shipping is always an added bonus!! I have rheumatoid arthritis which is an autoimmune disorder where the immune system gets bored and starts attacking your muscles and tendons. The medications which brought me to remission are gold salts and methotrexate. These medications have a drying side affect which severely affects the mucus production in my eyes, sinuses and mouth causing multiple problems. I started using Thera Tears Nutrition several years ago with amazing results. My dentist says my mouth is functioning normally again and his income has been greatly reduced. My eyes and sinuses are also more comfortable. Well.ca has been my ever faithful supplier and I am greatful to them because I have not been able to find this product anywhere else. My optometrist recommended this product to stave off eye disease. If it allows me to maintain my sight it is priceless. This product has really helped with my dry eyes. I have been taking it for over a year. As an added bonus I think it has improved my skin too. I started using this product for a eye gland related problem. It has really helped witht he dryness and redness and has seemed to improve my gland functioning. It has the added benefits of improving skin and hair because of the fish oils. I alwas enjoy ordering from Well it's always really fast and the free shipping is awesome. I will continue to use this product as long as I can afford it. My eye doctor recommended these supplements to help with my dry eye problems. I have been taking them for a few months now and notice a big difference. I have been able to cut back on the lubricating drops. Highly recommend these! I would so recommend this product to anyone with "dry eyes". In weeks time you will notice the results!!! This has been recommended by my opthamologist and it is great to help with my dry eyes. My dry eye symptoms are much better with this supplement along with my eye drops....Systane Balance. My eyes were always dry until I found this product. This product has helped my eyes feel alot less dry! For me it was almost immediate relief and I was able to wear my contacts again at work (where it's very dry) for the first time in a year. This is a great product and I will continue to use it for my dry eye condition. Be aware they can 'repeat' on you but if you take them with your meal that will be reduced or eliminated. I have got a medical problem called blepharospasm.The condition is treated by regular botox injections around the eye and this increases the dryness, that is present anyway... I find this product helpful in reducing dry eye, have been using it for about a year. Got them to help with Lasik dry eyes recovery, from week three, after reading about it online. These seems to contain what you need for dry eyes without any extra fluff that you'll get in your normal daily food if you eat right anyway! Only 2 capsules a day (as prescribed by my eye doctor), taken with a meal, will make a difference. More than just helping with dry eyes, it will improve your nails and hair too. Well worth it. After three months my eyes are feeling almost normal with only the occasional mild recurrence of 'dry eye'. I prefer "Thera Tears" to other fish oil supplements becuase it doesn't cause 'fish burps' associated with taking therapeutic levels of Omega 3's. Thera Tears are especially great for contact lense wearers. Initially my eye doctor prescribed them to me for my super dry eyes (as result of my contacts), but because of the fish oils, you will also find side effects include healthier skin, nails and hair. If you don't want it to give you "fish burps," as these types of supplements can, freeze them to take that fishy edge off. I only got to use this product for a few weeks before I had to stop since I am pregnant since it contain flax oil. However, I did find that it helped my dry eye. I will definately start using it again when I can. My eye doctor suggested over a year ago to take these for my dry eyes. I have found they indeed have given me lots of relief. I also eat salmon 4-5 times per week.